Federal prosecutors in California announced on Thursday three dozen charges against Michael Avenatti, the prominent attorney best known for his criticisms of President Donald Trump, accusing the lawyer of stealing millions of dollars from his clients and funneling their money into his own interests, including co-ownership of a $5 million private jet. The indictment was sweeping in its scope, accusing Avenatti of defrauding clients for more than four years. 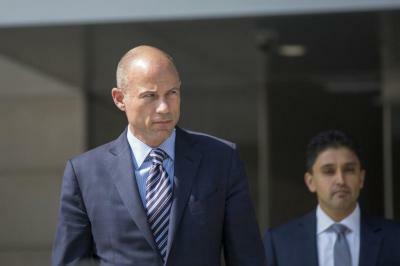 The charges included bleak details, including assertions that Avenatti’s alleged actions caused a paraplegic client to lose his Supplemental Security Income benefits, which are paid to adults and children who have disabilities, and prevented the same client from using settlement money to buy a home. Avenatti denied wrongdoing and tweeted that he will “fully fight all charges and plead NOT GUILTY.” The California case against him is separate from the federal case in New York accusing Avenatti of trying to extort Nike, the sports apparel behemoth. Avenatti’s circumstances shifted dramatically last month, when he was arrested in New York and accused by prosecutors of trying to extort millions of dollars from Nike by threatening to reveal allegations against the company unless it paid him. Geoffrey Berman, the U.S. attorney in Manhattan, called Avenatti’s actions “an old-fashioned shakedown.” On the same day, prosecutors in Los Angeles filed charges accusing him of wire and bank fraud, a case that officials said included misdeeds spanning years. The 36-count indictment details Avenatti’s interests outside of his work as an attorney, including coffee stores, a car racing team and a private airplane. It states that Avenatti’s alleged “scheme to defraud” would unfold the same way, beginning with him negotiating a settlement that would require payment to a client. The indictment also includes specific accusations about how Avenatti allegedly defrauded people. In the case of the paraplegic client, identified as “Client 1” in the indictment, Los Angeles County had agreed to pay a $4 million settlement to dismiss a lawsuit over constitutional violations that caused him “severe emotional distress and severe physical injuries, including paraplegia,” the indictment states. That client’s name is Geoffrey Johnson, according to Joshua Robbins, an attorney who said he is now representing him. The Avenatti indictment states that Johnson decided to buy a home after residing in assisted living facilities. But after Johnson was in escrow on the purchase, the indictment alleges, Avenatti told him he could not buy the house, because Los Angeles County had not approved his special needs trust – which was a lie, the document states. The indictment says that instead of going to Johnson, the settlement money instead went to Avenatti’s personal accounts and toward accounts associated with his racing team. To cover that up, the indictment continues, Avenatti allegedly made payments to Johnson that totaled about $124,000, along with rent payments to assisted living facilities, falsely describing these as “advances” on a settlement that had not come in yet. The indictment alleges that Avenatti rerouted $2.5 million intended for one of his clients to buy a private airplane for his company. Federal officials said that they had seized the jet on Wednesday. All told, Avenatti is facing 10 counts of wire fraud, 19 counts of tax-related charges, four bankruptcy fraud charges and two bank fraud charges. The other counts include allegations that he used wire transfers to move millions of dollars to carry out fraud, didn’t pay taxes and file income tax returns and submitted fraudulent applications for loans.